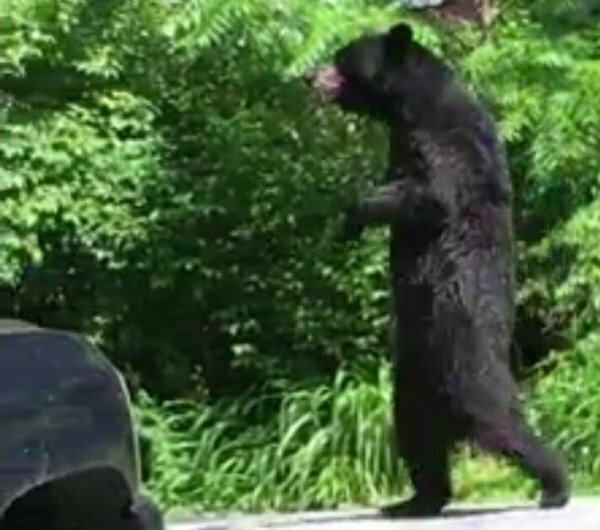 For the past two years, suburban New Jersey residents were visited by a bear that walked on his hind legs like a person. The injured bear nicknamed Pedals who learned to walk upright sparked an outpouring of sympathy on social media with many petitioning the state to step in and help the animal. Those petitions were rebuffed last year by wildlife officials, saying the animal appeared healthy and capable of taking care of itself. This weekend their worst fears were realized when it appeared a hunter had killed Pedals on the first day of bowhunting season. Five photos identifying the notorious bear submitted to the state Division of Fish and Wildlife confirmed that Pedals had in fact been harvested. The news of course sent shock waves across the animal rights community. But is this really such a bad thing? Pedals was likely in extreme pain. Bears are tough critters and can adapt to injuries. In this case, images show that Pedals was missing his right front leg and possibly suffered a broken left left, so there’s little doubt that this bear was not in great shape. A spokesman for the New Jersey Department of Environmental Protection told the New York Times that there was no practical way to single out one particular bear for protection. In related news on Monday, a bill in the New Jersey Legislature dubbed the “Pedals’ law” aimed at banning the bear hunt moved forward. The Democratic sponsored bill would require a five-year plan for non-lethal methods to control black bears as an alternative to hunting, according to the New Jersey Record.